Clearly the Starwood group subscribes firmly to the ideal of never letting go of a good location. 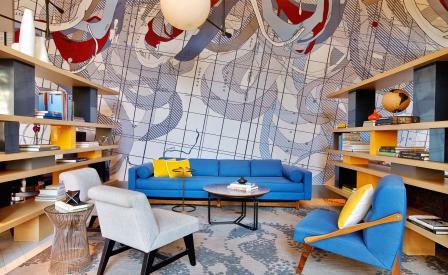 Case in point is its newly minted Le Méridien in New Orleans in a quiet nook that takes full advantage of its proximity to the brash buzz of the French Quarter and the Arts District, but without being overwhelmed by the crowds. The 410-room hotel has just emerged from a $29m renovation of the former W New Orleans, another Starwood sibling. Meyer Davis Studio has mined Le Méridien’s origins as a creation of Air France to celebrate the heady ideal of travel and glamour, 60s-style. Which explains the retro vibe that permeates the interiors with wallpaper depicting enormously magnified maps of New Orleans, bright primary colours and pastel hues, Louis Armstrong quotes, and homages to the annual bacchanalian festivities of the Mardi Gras parade. There are other diversions, not least short rib hash on the breakfast menu at the ground floor LMNO Restaurant, a rooftop pool lined with cabanas, and views of the Mississippi from the suites on the 16th-23th floors. The opening keeps on track Le Méridien’s goal to triple its portfolio in the Americas adding to a global haul that stretches from Thimphu and Bangkok to Dhaka and Qingdao.